The Trinamics family of side and end-load case packagers are ideally-suited for packing a wide variety of products. Capable of being loaded through the top, bottom or end panels – depending on the nature of the case design and the characteristics of the product – they offer a degree of versatility that allows them to be adapted to your line’s specific needs. This flexibility, combined with the packers’ swift cycle rates, contributes to a more efficient, more productive and more profitable packaging line. In this post, we’re going to take a closer look at some of the advantages offered by the Trinamics TR616SL and TR616EL case packers. With rates of up to 20 cycles per minute and 35 cases per minute, the TR616SL and TR616EL harness the power of a heavy-duty, flexible servo arrangement. Working in tandem with these swift rates, quick changeovers mean a reduction in downtime and a faster, more competitive packaging line. Utilizing Allen Bradley controls and a centralized Allen Bradley PanelView 300 HMI, the solid internals of Trinamics’ case packers are only half of the equation. Protected by a fabricated mild steel main frame and bolstered by stainless steel guards and contact parts, you can be confident that the case packing equipment from Trinamics is rugged and long-lasting. With a variety of case designs, sizes and material options available, the TR616SL and TR616EL can be manufactured to address your specific needs. 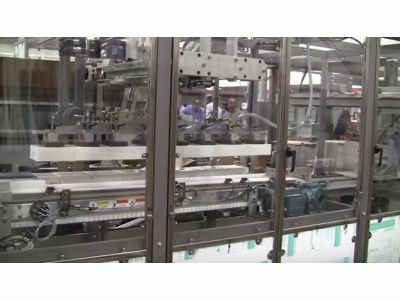 This flexibility, in combination with the packers’ compact fully-enclosed design, allows you to pick a case packer that works with the layout of your existing operation. As a leading supplier of case packers to a range of industries, Technical Packaging Systems is proud to work alongside Trinamics. The company’s dedication to engineering high quality, reliable equipment has earned them a reputation as the go-to manufacturer of case packers. To discuss your case packing needs and learn more about the Trinamics TR616SL and EL models, contact us today.